Today is the first day of Spring! Unfortunately, here in Michigan, it really does not feel like it, as it is still cold and gloomy. But that hasn’t stopped me of dreaming about when the weather catches up with the season we’re technically in. I cannot wait to go for a bike ride. While my husband keeps reminding me that I actually could go for a bike ride right now, having to bundle up in a coat, hat, gloves and scarf, and veer around giant puddles of melting snow isn’t quite the leisurely bike ride I had in mind. I think I’m going to send winter on its way by refusing to cook any more of its favorite foods. I’m going to start making burgers and hot dogs, so take THAT, winter. But, since I’m also aware that warmer weather = shorts and tank tops, I want to make sure that this Spring-inspired food is nutritious as well as delicious! This week, I’m teaming up with The United Dairy Industry of Michigan, which represents Michigan’s hardworking dairy farm families, to bring you healthy and affordable recipes for your family. 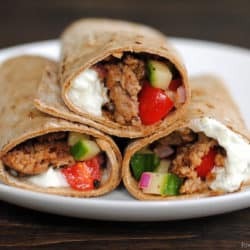 Yesterday, I made Big Ol’ Lentil Burritos, and today I’m back with another wholesome recipe that will give you a huge nutritional bang for your buck. I cooked these turkey burgers in a cast iron skillet inside, but they could also be made using a grill pan or an outdoor grill when spring finally, really, gets here. 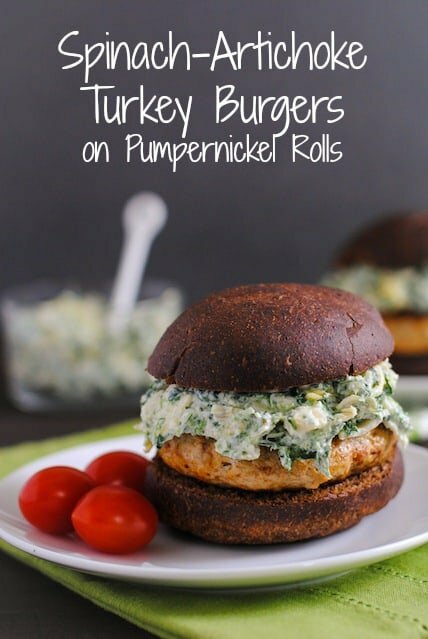 The topping is like a thicker version of spinach-artichoke dip, and I had to put these burgers on pumpernickel buns, of course. 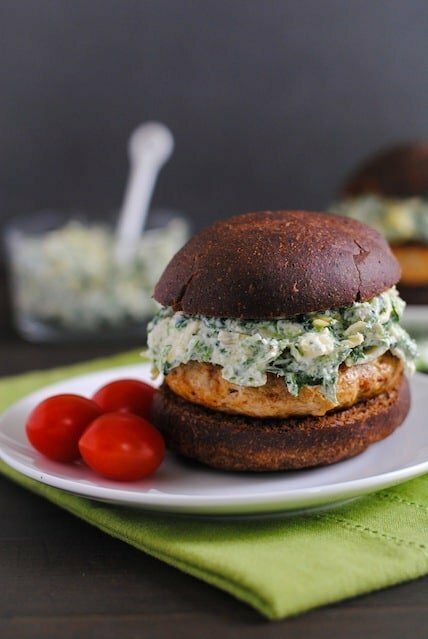 By using frozen spinach, canned artichoke hearts, yogurt and mozzarella cheese, these nutritious turkey burgers come in at only $1.95 per burger! 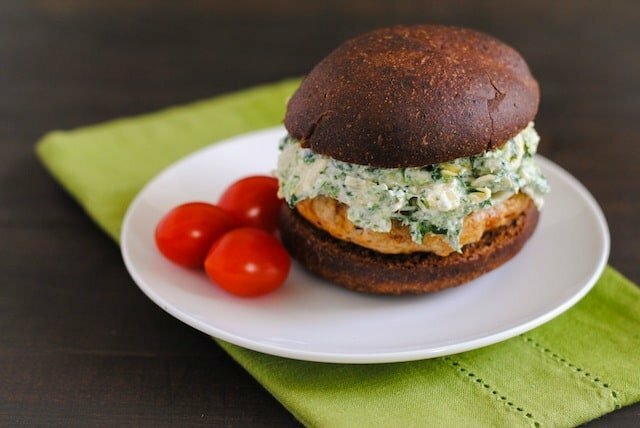 Make Turkey Burgers: In medium bowl, combine turkey, chili powder, salt, pepper and paprika. Form mixture into 6 patties. Heat cast iron skillet or grill pan over medium-high heat. Add oil and cook burgers, in batches if necessary, 10 minutes or until internal temperature reaches 160 degrees F, turning occasionally. Transfer burgers to plate, let stand 5 minutes (internal temperature will rise to 165 degrees F upon standing). Make Spinach-Artichoke Topping: In small bowl, stir together artichokes, spinach, yogurt, mayonnaise and cheese. 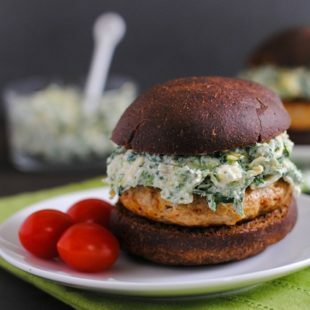 Serve Turkey Burgers on pumpernickel rolls, topped with Spinach-Artichoke Topping. I hear you about the lack of spring-bleh. But your burger is amazing. That artichoke dip is just fabulous! Thanks Jane! 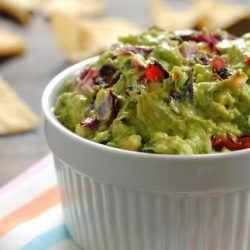 That dip was SO easy to make at home that I wonder why anybody buys it pre-made! Maybe if we all cook spring dishes, warmer weather and sun will come. Love these burgers! Let’s do it! I might still have some comfort food making an appearance around here (errr…this coming #SundaySupper), but that’s because I made it weeks ago and am just now blogging it. From here on out, I’m only COOKING summer food! haha. Whaaaat?! Cheap, delicious and healthy?! Three of my favourite things! I really need to make that artichoke dip and put it on everything. You need to come back to Vancouver right now and hide here until Michigan’s weather gets its act together. It’s cool but we have sunshine right now (sorry, not trying to rub it in!). Perfect biking weather! I want to come back to Vancouver now, bring my bike, and ride around and around Stanley Park all day. I’ll do that while you’re at work, then we can meet up for drinks and dinner. Then repeat as necessary until it’s nice enough for me to come home to Michigan. I would eat that healthy spinach artichoke dip any day, any time. And, as much as you want to bike, I want to play golf. Michigan can be so beautiful and enjoyable in the spring and summer – it sometimes just takes sooooo long to get here.